This exhibition marks the 40th anniversary of Georgetown’s Lauinger Library with a look at the origins of the University’s book collections. Their long and varied history dates back almost to the founding of the University in 1789 (if not before, since the Library includes books brought by the first Jesuit missionaries to Maryland in the 1630s). This exhibition takes up a few threads of that story, from the founding of the College Library, to the handwritten 1831 library catalog that documents the core collection—much of which still survives—to the highly focused Jesuitica collection formed by early librarian Thomas C. Levins, to the building of the dramatic Riggs Library and the acquisition at the end of the 19th century of one of Georgetown’s crown jewels, the 10,000 volume Americana library of John Gilmary Shea. These early developments formed the basis for some of the greatest strengths in the Special Collections Research Center today, especially its exceptional collections of Jesuitica and Catholic Americana. The exhibition includes several of Georgetown’s great treasures: a first edition of Wilson’s American Ornithology, to which the Library subscribed, and George and Martha Washington’s copy of Mark Catesby’s Natural History, donated by George Washington Parke Custis. The exhibition skips ahead to the Library’s millionth and two millionth volumes (respectively, a first edition of Milton’s Paradise Lost, and the rare broadside announcing George Washington’s Thanksgiving proclamation). It then concludes with a glance back at the building of the Joseph Mark Lauinger Library 40 years ago. “In my end is my beginning,” as poet T. S. Eliot put it: the principles the architects of a projected renovation and addition to Lauinger were recently charged with taking into account—principles derived from the ancient Roman architect Vitruvius—could be found on the shelves of Georgetown’s original Library in a 16th century edition. Having recourse not only to extensive records about the Library in the University Archives, but also to many of the original books themselves, is full of surprise and discovery. It is our hope that the rich resources and surviving collections highlighted in this exhibition will become the starting points for future research by Georgetown students and faculty about the history of books and libraries on the Hilltop. The guiding document for the foundation of Jesuit educational insti­tutions, the Ratio Studiorum, provides for the appointment of a librarian. John Carroll, the founder of Georgetown University, was a book lover as well as a lover of learning, and documentation for book purchases in the University Archives goes back at least as far as 1792. The real nucleus of the Georgetown Library was evidently formed upon the arrival in 1796 of its third president, Louis Guillaume Valentin DuBourg. DuBourg brought with him from Baltimore about 100 volumes; and evidence survives to document his activity in purchasing additional titles for the Library. As this suggests, the role of librarian seems early on to have been fulfilled largely by the president of the College, and at least by the turn of the century, the president’s room in Old South (no longer standing) also con­tained the College’s books—President Leonard Neale’s bed is said to have folded up into a cupboard during the day, allowing the room to function as a library. Access to the College Library was restrictive: it seems for many years to have been open for consulta­tion only at appointed hours, and primarily only by faculty. Purchase, James Ethelbert Morgan Fund. The deep interest in libraries of Georgetown’s founder, John Carroll, is wit­nessed by this, his copy [“+J. Bisp. of Balte.”, i.e., John Bishop of Baltimore], of the 1802 Catalogue of the Library Company of Baltimore, of which Carroll was President and a founding member in 1797. The Library Company was a subscription library—an annual fee allowed members to check out books. Carroll has placed marks next to the entries for some of the books. Robert Telfair. Key to Gough’s Practical Arithmetic. Belfast: for the author by T. Storey, 1794. GTC E609. If Gough’s Practical Arithmetic’s appearance on the Mathew Carey invoice (fifth item from the bottom) means it was indeed used in the Georgetown curriculum in the 1790s, Georgetown faculty (including James Redmond, who put his signature in this copy in 1806) surely employed this copy of the Key, containing answers to the problems in Gough, to correct students’ work. Charles Rollin. The Ancient History of the Egyptians, Carthaginians, Assyrians…. London: C. Bathurst, 1795. GTC E537. With James Rice to William DuBourg, autograph letter signed, Baltimore, Sept. 8, 1797. Facsimile [original in the Rev. William DuBourg Papers, Box 1 Folder 3]. With portrait of Louis Guillaume Valentin DuBourg (1766-1833), photo­graphic reproduction. University Archives. This would have been a brand new book when Father DuBourg ordered it in 1797 from Baltimore bookseller James Rice, who no doubt imported it from London. Rice gave DuBourg a 10% discount on his order. In addition to a carton of books, the will of John Carroll (1735-1815) pro­vided a then sizeable bequest to Georgetown, £400 in 4% stock. The money could be used to form an endowment, with the interest to be spent on books for the college library; or the capital could be spent out if it could be used “advantageously in the purchase of valuable Books of real learning and utility suitable to the course of studies pursued in the college.” Georgetown Presi­dent Antonio Grassi seems to have taken the latter course, and seems to have spent the money primarily on scientific works. Georgetown College Ledger A-1, p. 91 [Facsimile; original in Georgetown University Archives]. The earliest of GeorgetownCollege’s financial ledgers includes accounts not only for purchases by the College, but also for individual students, whose personal funds the College managed on their behalf. “Clarks Invoice of Classic books” lists major Greek and Latin authors: presumably some of the earliest purchases for the Library. The books itemized on the second half of the page are evidently student textbooks, bought in quantity from prominent Philadelphia Catholic printer and bookseller Mathew Carey on July 12, 1792. John Wilson. An Introduction to Arithmetick. Edinburgh: R. Drummond for the author, 1741. GTC C305. An early hand suggests that the author teaches “in Georgetown College”—this can hardly be, since he lived in the early 18th century. The same hand has added a signature for William DuBourg, president of Georgetown 1796-1798, to the list of names testifying to Wilson’s competency. A student prank? Or faculty playfulness?—since it was faculty who had easiest access to the Library? Horace. Sermones & Epistol[a]e. Paris: Dionisio Roce, 1503. GTC A245. The handwritten 1831 catalog of the Georgetown College (“GTC”) Library is the earliest surviving record of the complete holdings of the Library, compiled by Librarian James Van de Velde. The origi­nal Library followed an alpha-numeric shelfmark scheme based on a modified Greek alphabet. The shelfmarks made no refer­ence to subject (unlike the Dewey decimal and Library of Congress classifi­ca­tion schemes); instead, they served merely as a convenient way to group books by size. One would have had to consult the catalog—or the librarian—to locate books by sub­ject. 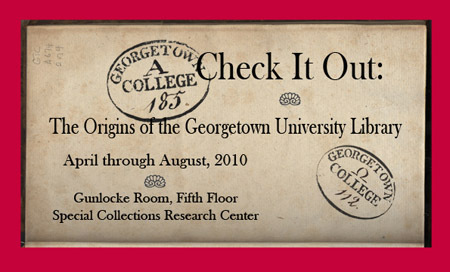 Books that were in the collection are readily identifiable by the oval-shaped Georgetown College stamp and the handwritten GTC shelfmark within the stamp. Using the catalog and these distinguishing marks, curators have reassembled about half of the 11,150 volumes as a separate group in Special Collections, thereby preserv­ing a remarkable, tangible window into the early life of the College. This case includes examples of the kinds of books in the collection, including books from some of Georgetown’s earliest donors. James Van de Velde to Francis Dzierozynski, autograph letter signed, July 1825. MarylandProvince Archives Box 61, Folder 14. Librarian James Van de Velde’s florid penmanship seems to have earned him the “authorship” of the volume on Calligraphy in James Simpson’s trompe l’oeil library door. Note the flourishes in his signature in a note requesting the return of a book from fellow faculty member Francis Dzierozynski in 1825. This selection from the original (“GTC”) Library illustrates the way they were grouped by size, presumably to maximize shelf space. The diamond-shaped spine labels still survive on these examples—useful in identifying them as part of the pre-1831 Library. The preponderance of the smallest books, from the G section, are Catholic and devotional in nature—this selection includes a 1587 life of Ignatius of Loyola, French and German translations of the Imita­tion of Christ, and several works by Jeremias Drexel, S.J.—but there are excep­tions, such as a pocket edition of Samuel Johnson’s The Rambler. Robert Lowth. A Short Introduction to English Grammar. Philadelphia: R. Aitken, 1775. GTC F468. Open to p. xi. In addition to a printed “Georgetown College” booklabel inside the front cover, a hand-stamped “G.T.C.” was placed in the middle of page xi in this textbook: possibly as a deterrent to theft. (Even if the cover and title page were removed, the book could still be identified as Georgetown’s by turning to page 11.) This practice works only if applied consistently: but only a fraction of the books examined for this exhibition contain the mark in that location. While the books were shelved by size, the GTC Catalog organized them intellectually by subject—though not in quite the way librarians would today. The catch-all category “Promiscuous Sciences” (“promiscuous” in its older sense of “miscellaneous”) included such works as the copy of Diderot and d’Alembert’s Encyclopédie (8th line down) on display in this case. This copy of the works of the founder of Protestantism has been in the Georgetown University Library since at least 1831, as attested to by its inclu­sion in the 1831 GTC catalog. On display is a page from one of Luther’s scathing satires, illustrated by woodcuts depicting the various monastic orders. Élisabeth Cacaoult de La Mimardière. Le Triomphe de la Raison, ou, Lettres de Deux Jeunes Dames de Qualité. Londres: C. Dilly, 1785. GTC E599. This rare female-authored epistolary novel (the English Short Title Catalogue database lists only six copies in other libraries) seems out of place in the early library of a Jesuit college. Like a number of other GTC books, it bears a printed “COLLEGE” book label. Jean-Antoine Nollet. L’Art des Expériences, ou Avis aux Amateurs de la Physique, sur le Choix, la Construction et l’Usage des Instruments. Paris: P.E.G. Durand, 1770. Volume 2. GTC F182. A stray sheep returns to the fold. This three-volume work on scientific instru­ments, part of the pre-1831 Library, and withdrawn probably in the mid-20th century, returned to Georgetown on May 11, 2010, thanks to the sharp eyes of alumnus Eric Wind, who spotted it among the listings of an online bookdealer. Index Librorum Prohibitorum.Rome: Typographia Rev. Camerae Apostolicae, 1806. Despite such reactions to illicit books, documentation on restrictions on the circulation of forbidden books in the Library has not yet emerged. By 1831, at least, they seem to have been kept on the same shelves as other books; so while their use likely required permission (and only faculty would likely have had access), they seem not to have been segregated. This copy of the Index later made its way, along with many other GTC books, into the library of Woodstock College, the Jesuit seminary founded in 1869, and returned to Georgetown along with the Woodstock Theological Center Library in 1974. Denis Diderot and Jean Le Rond d'Alembert. Encyclopédie, ou, Dictionnaire Raisonné des Sciences, des Arts et des Métiers. Geneva: Pellet, 1777-1779. Planches [Plates] vol. 1, open to a plate on military fortifications. Although condemned by the Index, the Encyclopédie, one of the most signifi­cant achievements of the Enlightenment, seems to have been held in esteem by Maryland Catholics. Not only did Georgetown seek out a set (the smaller, quarto edition on display here, purchased possibly with funds pro­vided in Archbishop John Carroll’s bequest), but in 1798 Carroll’s cousin, signer of the Declaration of Independence Charles Carroll of Carrollton, had donated a set of the more expensive folio edition to the Library Company of Baltimore, of which John Carroll was President. Antoine Louis Claude, comte Destutt de Tracy. A Treatise on Political Economy. Georgetown: J. Milligan, 1817. GTC B322. The GTC collection preserves good examples of the local book arts. Early Georgetown printer Joseph Milligan seems to have had a keen interest in publishing contemporary works on economics, including this one, with a preface solicited from Thomas Jefferson. This bookbinding—on the fancy side for American bindings of its period—was likely executed in Milligan’s shop. The Library has always relied on donors to help build its collections, today no less than in its early years—though we keep better records now than we did then. Often the only way to tell whether a book was a gift is to open it and look inside. This shelf includes books from several noteworthy early donors, along with some of their typical marks of ownership. Some of these markings remain a mystery, and may repay further research. Niccolò Machiavelli. The Art of War. Albany: Henry C. Southwick, 1815. GTC N289. Open to title page, with facsimile of gift inscription. This book (also on the Index) seems to have been donated by James Placidus Ord, a Georgetown student 1835-37 and later an officer in the Civil War, or possibly by his father James Ord (1789-1873), a Georgetown gradu­ate of 1806 and reputed to have been the son of King George IV and Mrs. Fitzherbert—or by one of several other James Ords. The Ord family papers were eventually donated to Georgetown’s Special Collections Research Center. James Cook. [Plates to the Voyage to the Pacific Ocean.] [London: W. and A. Strahan, 1784]. GTC D981 (2). Open to “Sketch of the Typa and Macao” [south coast of China], with fac­simile of gift inscription from front free endpaper. Burwel S. Randolph, a collateral descendant of Thomas Jefferson, donated a number of books to Georgetown at some point prior to 1831. The books reveal Randolph’s interest in travels and voyages; and they carry evi­dence of his own sojourns: he inscribed them in various places, including Newport, R.I. (where he bought his set of Captain Cook’s Voyage) and Kingston, Jamaica. The Manner of Performing the Novena: or, The Nine Days Devotion to St. Francis Xaverius, of the Society of Jesus, and Apostle of India. [St. Omer: s.n., 1690]. GTC G1101. The signature of Enoch Fenwick, 12th president of Georgetown, appears on the title-page of this scarce Jesuit devotional work. From its earliest days, the Library has amassed an important collection of English Recusant books printed, as this one, on the Continent and smuggled into England, or on clandestine presses in England, to avoid the harsh penalties for publishing Catholic books in Protestant England. Thomas C. Levins (1789-1843), professor of mathematics and natu­ral philosophy, was appointed Georgetown’s first official librarian in 1824, although he held the position for less than a year. In early 1825 he was expelled from the Society of Jesus for insubor­di­nation and left for New York, where he became pastor of old St. Patrick’s as well as working in journalism for a time. His real impact on the Georgetown Library came after his death, when Georgetown acquired his extensive personal library. Levins was a serious and focused collector, with interests including incunabula (books printed before 1501), science and mathematics, Erasmus, important Bibles, and, especially, books by Jesuits as well as anti-Jesuit works. James A. Ward, S.J. wrote out a catalog of Levins’s books after they came to Georgetown in 1844, arriving at a total of 1,991 volumes, including eleven incunabula. The list is broken down into categories by subject, and the entries give sufficient detail to identify the books with little trouble today, aided fur­ther by Levins’s tendency to inscribe his name on their title pages. While his books can be located in the card catalog in Special Collections, catalogers are still entering them into GEORGE, the Library’s online catalog. Among early major gifts was this monumental Chinese-French-Latin diction­ary, commissioned by Napoleon in 1809. It features impressive scholarship and typography, with over 13,000 woodcut Chinese characters. It was pre­sented to Georgetown in 1821 by Hyde de Neuville, Envoy Extraordinary and Minister Plenipotentiary of France, on behalf of the French government. This is Thomas C. Levins’s copy of the catalog of the cabinet of curiosities—one of the forerunners of modern museums—formed by Jesuit polymath Athanasius Kircher, who produced some of the most remarkable illustrated books of the 17th century. The engravings range from Egyptian hieroglyphics to technological marvels such as a “magic lantern,” an early slide projector. Heinrich Institoris and Jakob Sprenger. Malleus Maleficarum. [Nuremberg: Anton Koberger, 1496.] Incun. 1496 .I5. This incunable was printed by one of the great early printers about four decades after Johann Gutenberg finished printing his Bible. The “Witches’ Hammer” was written in the 1480s to assist church officials in rooting out suspected witchcraft. The printed title page includes not only Levins’s signature, but also a gift inscription from Johann Gottfried von Aschhausen, Bishop of Bamberg, Germany, in 1612 to the JesuitCollege at Bamberg—the year in which that institution was founded, at the Bishop’s invitation, as part of a counter-Reformation house-cleaning. This book may have played a part in the witchcraft trials that the Bishop is known to have encouraged. Ottavio Ferrari. Analecta de Re Vestiaria. Patavia: P.M. Frambott, 1654. Shandelle 1670 .F4. Open to Plate 13, opposite sig. L1 (p. 81). Among Levins’s books on classical antiquity is this scholarly treatise, illus­tra­ted with fine engravings, on the clothing of ancient Romans based on such surviving evidence as statuary and coins. This title shows the importance of old library records for provenance research: though Levins never placed his signature in the book; the handwritten catalog shows that it was his. Thomas C. Levins “personalized” this book by writing his initials on the parchment of the upper board. This scarce book, cast in the form of a dialogue between “Adam” and two interlocutors, is an example of Levins’s intensive collecting in the area of Jesuit controversial literature. Mark Catesby. The Natural History of Carolina, Florida and the Bahama Islands. London, 1731-43. Volume 1. Open to Plate 16 [Ivory-billed Woodpecker ]. Alexander Wilson. American Ornithology. Philadelphia: Bradford and Inskeep, 1808-14. GTC Z492, Volume 1. Open to Plate 3 [Yellow-shafted Flicker, etc.]. Georgetown’s early Library was relatively light on the big expensive hand-colored plate books—botany, ornithology, atlases—favored by wealthy collectors. This case highlights two note­worthy exceptions. On July 4, 1833, George Washington Parke Custis donated Mark Catesby’s Natural History—the earliest monu­mental plate book to feature North American flora and fauna. This copy was purchased by his ancestor John Custis, who knew Catesby; before coming to Georgetown, it was in the library of George and Martha Washington at Mount Vernon. The hand-colored engrav­ings include depictions of now-endangered or extinct species, including the ivory-billed woodpecker. The other book in this case, Alexander Wilson’s American Ornithology, was the most significant attempt to catalog and describe American species of birds before Audubon. It was a purchase—the Georgetown College Library is listed among the sub­scribers—and at $12 for each of nine volumes, an expensive one. Vitruvius Pollio. De Architectura. [Lyon]: Ioan. Tornaesium, . GTC π237. Open to sig. O3. Augustin de Casati. Poemata Graeca et Latina. Dresden: Harpeterianis, 1777. This volume illustrates the peregrinations of many of the books from Georgetown’s early collections. It came with the collection of Thomas Levins, later found its way into the library of the Classics Seminar, probably back to Riggs, was at some point withdrawn, then rescued presumably by a local collector who probably later donated it back to the Library. While it is hard to fault our predecessors for withdrawing it—after all, how many of us, even Classics majors, have time to puzzle our way through 18th-century neo-Latin verse?—we are grateful once again to be able to make it available for discovery. This book, with its emphasis on calculation in the service of navigation, fittingly came from the library of James Curley, S.J., who studied at Georgetown, then served as Professor of physics, mathematics, and botany—and as Librarian from 1860-64 and 68-69. He also drew up the plans and supervised construction of the Observatory. The library was moved from Old South (no longer standing) into the (Old) North building in 1831. College art instructor James Simpson (1805-1880) painted the door of the new library with a trompe l’oeil depiction of shelves of imaginary books whose whimsical titles form verbal caricatures of the work of Georgetown faculty of the time. The main library collections did not circulate to students until into the twentieth century. Thus, students, societies, and seminar libraries were created, mainly by the students themselves. These libraries continued even after the opening of Riggs, including the Seminar Libraries in the 1930s for Philosophy, English, Political Science, and Economics. For the sciences, there were libraries for Physics, Chemistry, Biology, Mathematics, and Astronomy (in the Georgetown College Observatory). C.M. Bell’s Photographic Studio, Washington, D.C.
An astronomical observatory built between 1843 and 1844 housed an early “branch” library, the Astronomy Library in a room below the dome. By the 1850s, the Astronomy Library held over five hundred volumes, many of which have been absorbed into Lauinger’s circulating stacks. The Seaman’s Daily Assistant. New York: W. Elliot, 1810. This book, with its emphasis on calculation in the service of navigation, fittingly came from the library of James Curley, S.J., drew up the plans and supervised the construction of the Observatory. He had studied at Georgetown, then served as Professor of physics, mathematics, and botany—and as Librarian from 1860-64 and 68-69. Marie-Charles-Théodore Damoiseau de Monfort. Ephemerides Nauticus. Lisboa: Na Typographia da Academia R. das Sciencias, 1806. William Whewell. Astronomy and General Physics Considered with Reference to Natural Theology. London: William Pickering, 1833. The Wonders of the Universe. Exeter: J. and B. Williams, 1843. J. Russell Hind. The Solar System. New York: G. P. Putman, 1852. Camille Flammarion. Catalogue des Étoiles Doubles et Multiples en Mouvement Relatif Certain. Paris: Gauthier-Villars, 1878. Georgetown University Library now has two copies of Newton’s Principia in first edition. The first was part of the original library (GTC shelf number Α310) as well as in the book collections in the Observatory; it is now preserved in the reassembled “GTC” collection. This second copy bears a “Mathematics Seminar” stamp and thus was more accessible to students. Charles Rollin. Ancient History. New York: Huntington, 1815. Rollin’s Ancient History was one of the earliest books collected by the library. This 1815 edition has been a part of several campus library collections most notably the collections of the Philodemic Society. (See also its catalogue slip at left) Jesuit and bibliographer Father Wilfred Parsons included it in his Early Catholic Americana (number 512), and at last, it has been added to the rare books collections. Note the two versions of Philodemic Society bookplates, the newer version pasted on top of the older. In addition, the book is stamped “Hirst Library,” which after 1900 housed the combined Students’ Library in Healy Hall. College literary and debating societies created their own library collections across the country in the nineteenth century. At Georgetown, the oldest such society was the Philodemic Society, founded in 1830. It was shortly followed by the Philomosian in 1839. Surviving in the Georgetown University Archives is an incomplete early catalog for the Philodemic Society, with 237 titles with publication dates ranging from the late 18th to mid-19th centuries. Displayed here is a small selection, including the slip for Rollin’s Ancient History (at right). Displayed here are student circulation records showing the use of an as yet undetermined society library. At the left, is the record for Thomas J. Semmes (A.B. 1842, A.M. 1845, LL.D. 1880). Semmes chaired the joint committee on designing the Confederate flag and seal. He also served as President of the Society of Alumni, GeorgetownUniversity. Displayed as well are facsimile pages showing library fines and a selection of periodicals, including the Penny Magazine (at the right). The library has retained several such 19th-century periodicals from students, societies, and seminar libraries; these in turn provide clues for our researchers today regarding the reading habits of past students, including their recreational reading. American edition, New York: J. S. Redfield. The British publisher Charles Knight advocated for and published inexpensive books and magazines aimed at the working classes, such as the Penny Cyclopedia, the Penny Shakespeare, and this first venture, the Penny Magazine. Since the magazine was also published in America, students had easy access to this 19th-century version of general interest reading material. “Our Society Libraries.” Georgetown College Journal. Vol. 4, no. 5 (Feb. 1876): pages 54-55. Facsimile. In 1874, students considered merging their Societies’ Libraries into one, thus increasing their usefulness; and by 1884 the aggregation had occurred. Senior Division students could subscribe for access to the Societies’ Reading Room, later renamed the Students’ Library. This published catalogue documents the aggregated collections of the Societies’ Libraries. The catalog arranges the titles by topic, but does not provide publication information for any given title. Topics include: Biography, History and Travel, Novels and Stories, Poetry, Rhetorical and Literary, and Miscellaneous. Displayed here are sample titles from the catalog, including William Hazlitt’s English Common Writers, J. T. Headley’s The Sacred Mountains, and Austen Layard’s Nineveh. J. T. Headley. The Sacred Mountains. New York: Baker and Scribner, 1847. Austen Layard. Nineveh and Its Remains. New York: G. P. Putnam, 1849. The Students’ Library moved from the ground floor to the first floor in Healy in 1900, and was renamed the Hirst Library and Reading Room in the 1901-02 academic year. Alumnus Anthony A. Hirst provided the funds to furnish the library. The Hirst Library functioned as an undergraduate library. Although students paid an annual fee for its use, the library was not otherwise restricted to societies’ members, graduate students, etc. The collections contained approximately 5,000 books, newspapers, and magazines. Later, this space would house the School of Foreign Service Library and then the Periodicals Room for Riggs Library. The main library collection in the (Old) NorthBuilding had outgrown its space before the centennial in 1889. The exterior of the HealyBuilding was completed in 1879, and the third and fourth floors in its south pavilion were selected by then University President Patrick F. Healey, S.J., for whom the building is named. However, a lack of money prevented the library from being completed. During the centennial celebration, it was announced that Washington banker Elisha Francis Riggs (1851-1910) would donate $10,000 to establish the library. Mr. Riggs took a continuing interest in the construction and paid all associated costs, even though the final bill exceeded the estimate by 20 percent. Into the mid-twentieth century, the main library collections expanded into other rooms in Healy Hall, including an annex (paid for by Mr. Riggs) near the Hirst Reading Room and even into the Hirst Reading Room itself as a Periodicals Room, when the School of Foreign Service Library ceased separate operation in the 1950s. E. Francis Riggs donated the money for the Library in Healy Hall. The Library was to be a memorial to Mr. Riggs’ father, George W. Riggs, whose love of books was well-known, and for his brother, T. Lawrason Riggs, who had attended Georgetown from 1874 to 1876. This photograph was taken just before the book collections were moved into Riggs. When the Library opened, it housed around 50,000 books. By 1907, there were more than 80,000 books in the Library, and by 1937, over 200,000. German-born architect Paul J. Pelz (1841-1918), who with John L. Smithmeyer had designed the Library of Congress and the exterior of Healy, returned to supervise the construction of Riggs. His design for Riggs is similar to other libraries built around the same time. The Library has a central court surrounded by three levels of balconies. Each level is divided, using book stacks, into twelve alcoves. The distance between the levels—slightly over seven feet—is designed to allow any book to be reached without the use of a ladder. Mr. Riggs donated the elegant oak library furniture shown here in this photograph. In 1909, he gave an additional $10,000 to construct a library annex on the second floor of Healy directly beneath the Library. The author dedicated this book to William Wilson Corcoran (1798-1888), who in turn inscribed this copy to E. F. Riggs (see inscription facsimile to the right). Corcoran had been George Washington Riggs’ business partner. This copy circulated in the stacks until 1998, when it was transferred to the rare books collections. This image demonstrates other uses for the Library: a photographic opportunity for the prep. school. Actor John Barrymore attended Georgetown between 1895 and 1898; he appears in the second row of this image, fourth from the left. Members of the University’s track team, complete with running shoes, posed somewhat incongruously in front of the Library’s card catalog. As the Rules indicate most students were “not allowed to take books out of the library,” and only seniors and graduate students could enter the library at all. These rules are undated, but they are written on the back of an 1893 commencement invitation. Felix Fabri. Eigentliche Beschreibung der hin vnnd wider Farth zu dem Heyligen Landt gen Jerusalem. [Frankfurt am Main], 1556. This sixteenth century guidebook to the Holy Land was once in the collection of E. Francis Riggs (see bookplate to the left). An earlier provenance is also displayed, signed on the flyleaf in the contemporary hand of Carolus Lederer (Nuremberg, 23 August 1578). The book also retains evidence of a Shandelle collection shelf mark (1556 .E), which indicates that it has likely been in the main Library’s rare books collections since Father Shandelle’s tenure. Father Shandelle (1848-1925) directed the Library from 1895 until 1922, a vocation that matched well with his knowledge of languages and literature and his great love of books. As Librarian he influenced both students and colleagues; he was also a member of the District of Columbia Library Association, established in 1894. Father Shandelle died in November, 1925, after thirty years at Georgetown, and most of them spent as Librarian. As a memorial, The Shandelle Collection was established, arranging in chronological order from 1501, approximately 1,000 books from the Library’s collection. The collection continued to grow into the 1950s. This collection represents a conscious attempt to cull a rare books collection, preserving examples of early printing, fine bindings, first editions, notable autographs, or other indications of rarity. Shandelle books are still arranged in chronological order, starting with the sixteenth century. Displayed here is a selection of books from this collection. Adam Smith. An Inquiry into the Nature and Causes of the Wealth of Nations. London: W. Strahan and T. Cadell, 1784. Volume 1. Sir Walter Scott. Kenilworth. Edinburgh: A. Constable, 1821. Three volumes. Charles Seager. The Female Jesuit Abroad. London: O. C. Marcus, 1856. Miguel de Cervantes Saavedra. Don Quixote. New York: Hurst, [1870?]. Izaak Walton. The Complete Angler. London: S. Bagster and Sons, 1893. As early as the 1930s, Riggs Library had outgrown the available space in Healy. Students complained about the layout and associated service problems and, by the 1950s, even the Director of Libraries, James B. Horigan, S.J., termed the space 'totally inadequate'. Complaints about library facilities from students and library staff were echoed by Middle States Evaluation Teams. Their reports in 1951 and in 1960 emphasized the need for a new library. In 1964, the University President formally established a New Library Planning Committee, and in 1970 the Joseph Mark Lauinger Memorial Library opened its doors. Today, Riggs, one of the few remaining cast-iron libraries in the country, is used as a reception space while continuing to serve its original purpose of housing books. This case examines the connections a library collection can provide for scholars. Reverend Joseph M. Finotti, S.J. (1817-1879) became librarian for Georgetown for a brief period in the late 1840s, not long after he had joined the Jesuit order. His life’s work, Bibliographia Catholica Americana, lists Catholic writings published in the United States until 1820. When Finotti died in 1879, his impressive personal library was sold at auction by the arrangement of his friend John Gilmary Shea. Georgetown acquired several items from Finotti’s collection at this time. Also deeply interested in Catholic history, about which he published extensively, John Gilmary Shea (1824-1892) became the preeminent Catholic historian of the nineteenth century. Just prior to his death, Georgetown arranged to purchase Shea’s considerable collection of some 10,000 books, periodicals, and pamphlets. Shea’s collection—which at the time of delivery filled almost one third of the still new Riggs Library—continues to influence the scope of collecting today. In the 1930s, Reverend Joseph Wilfred Parsons, S.J. (1887-1958) found many examples of rare Catholic Americana on the shelves in the Library, treasures amassed by collectors like Father Finotti and John Gilmary Shea. As a result, he continued the work of Finotti and Shea, who together had started to revise Finotti’s bibliography; and in 1939, Parsons published Early Catholic Americana, greatly expanding upon Finotti’s and Shea’s work. Dubbed the “Father of American Catholic History” by his biographer, Father Peter Guilday, John Gilmary Shea (1824-1892) spent over forty years in active scholarship, publishing extensively on American history, particularly American Catholic history, including a Memorial of the First Centenary of Georgetown College, D.C., Comprising a History of Georgetown University and his last great work, the massive History of the Catholic Church in the United States. Shea wished his book collection to be kept together and made available for future researchers: “I should like to see it in some Catholic Institution where it would be preserved and increased.” That wish is now a reality, as his collection is frequently used, and the subjects Shea collected still influence acquisitions in the Library. Although Shea wished simply to give his library to the Jesuits, he realized that his health was failing and that he needed to provide for his wife and two daughters. The document shown here details the complex agreement Shea made with then University President Reverend J. Havens Richards, S.J. Essentially, Georgetown agreed to publish the final volumes of Shea’s History of the Catholic Church in the United States by buying five hundred sets in exchange for Shea’s collection. The sum exchanged equaled $10,000, or roughly one dollar per book. The Laity’s Directory. New York: M. Field, 1817. The Garden of the Soul, a manual of spiritual exercises, was the first Catholic prayer book printed in English in North America. It was also among the first titles purchased by Father DuBourg for Georgetown (see the facsimile of a DuBourg receipt in case 1). And it was possibly Reverend Robert Molyneux, S.J. (d. 1808), Georgetown’s second president, who had this edition published in Philadelphia around 1773. Benjamin Franklin. Experiments and Observations on Electricity. London: F. Newberry, 1774. Fifth edition. Shown with facsimile of half title page above, bearing the inscription of Charles Carroll of Carrollton. One of the treasures of Shea’s collection is this copy of Ben Franklin’s On Electricity inscribed by Charles Carroll of Carrollton, a Maryland signer of the Declaration of Independence and cousin of Archbishop John Carroll. Charles Carroll indicates in his inscription that he was given this book by the author. This selection shows the Shea collection’s strengths in Native American languages, especially as documentary resources for Catholic missionary work. In addition to hymnbooks, the collection holds catechisms, printed and in manuscript, including a circa 1700 manuscript catechism in Mohawk, which is currently undergoing conservation treatment to ensure its continuing availability for research. The Shea collection holds periodical holdings, including as scarce American Catholic newspapers and rare early issues of The Cherokee Phoenix, the first newspaper for a Native American tribe (the first issue shown here in facsimile). The Holy Bible. Philadelphia: Carey, Stewart, and Company, 1790. This is the first edition of the first Catholic Bible printed in the United States. Philadelphia publisher Mathew Carey (1760-1839), from whom Georgetown made some of its earliest book purchases, published this version of theDouai and Rheims Bible by way of subscription. Among the subscribers were John Carroll and other members of the Carroll family. The “GTC” (or original library) collection holds a later (1805) edition at shelf mark Α125. Father Finotti is shown in this Colorado studio photograph holding a book and standing next to an image of Pope Pius IX. New York: Bangs and Company, 1879. His library as a collection is a peculiar one. The part bearing on the Church of which he was a zealous clergyman, especially the works printed in the last and early in the present century, as well as his collection of newspapers and periodicals, it would be almost impossible to get together again, certainly not without great patience, time and expense…. Up to this time, however, such books have been so generally disregarded that few can be found in any of our public libraries or even the collections of scholars, and opportunities like the present will rarely occur. Finotti’s collection greatly inspired Shea, as a collector himself, and Father Parsons, as a bibliographer. Georgetown University Library has an extensive Bible collection, including Bibles in many languages, copies of the original Rheims and Douai Bibles, and Protestant Bibles left behind by past students. Father Parsons includes early Catholic American Bibles in his bibliography. Here, Father Parsons examines a selection of these Bibles. Georgetown University Library celebrated two milestones in the late twentieth century: the acquisition of its millionth and two millionth volumes. On November 20, 1983, Chairman of the Library Associates, the Honorable John W. Snyder, presented John Milton’s Paradise Lost (1669) as the official millionth volume. Contributions from 170 members of the Library Associates and other friends of the Library funded the purchase of this gift. And on May 4, 1994, Dr. Marshall B. Coyne presented the official two millionth volume, his gift of George Washington’s broadside proclaiming the first national day of Thanksgiving. By the mid-1940s, the Library had outgrown Riggs Library and needed more space. Complaints about library facilities from students and library staff were echoed by Middle States Evaluation Teams. Their reports in 1951 and 1960 emphasized the need for a new library. In 1964, the University President formally established a New Library Planning Committee. While ideas about the optimal size and capacity of the new facility remained relatively fixed over time, the same was not true of its architectural style. But regardless of style, the new library building was to contain some 175,000 square feet of space, a significant increase over the almost 57,000 square feet provided by Riggs Library and its various annexes in Healy and Maguire Halls. John Carl Warnecke and Associates were chosen to design the building. Ground broke on June 10, 1967, and the building was ready for collections to be moved in by March, 1970. The library was named for Joseph Mark Lauinger, a 1967 alumnus and Army first lieutenant from Tulsa, OK, who was killed while commanding a reconnaissance mission in Vietnam on January 8, 1970. Making the announcement, University President Robert J. Henle, S.J., stated that the naming “reflects a tradition of dedication and devotion to Georgetown, to our Church and to mankind. It provides the entire Georgetown community with an enduring impetus and a perpetual reminder of devoted service and supreme sacrifice.” Lieutenant Lauinger was posthumously awarded the Silver Star for gallantry in action, the Bronze Star Medal, and the Purple Heart. These medals are on display in the lobby of the Library. Opinions about the external appearance of Lauinger Library differ. Press critiques of the building at the time of its dedication were, however, generally favorable. The Evening Star described it as “adding an imposing new shape to the Potomac Palisades setting,” The Georgetowner termed it “an architectural landmark” that 'excites the eye and demands of the mind' and The Washington Post commented that “the architects managed to blend it into the cityscape, if not unobtrusively, [then] successfully.” And the Library's design was recognized by the American Institute of Architects in 1976. The location designated for the library had, over time, been home to a number of athletic facilities, including a baseball field, an athletic track and, later, tennis courts. The construction company began moving earth on September 5, 1967, changing the profile of the Healy lawn area for the first time since the building of Copley and White-Gravenor in the 1930s. The tower crane pictured here collapsed in dramatic fashion on December 2, 1969. Fortunately, no one was injured in the accident and the slight damage done to the roof did not delay the building’s completion. Library service was suspended from Thursday, March 26 to Sunday, April 5, 1970, while books were transferred from Riggs to Lauinger. Volunteers from Alpha Phi Omega and the Collegiate Club supplemented the work of a moving company. The Library opened its doors to students on April 6, 1970. The Library was dedicated in a ceremony that took place in Gaston Hall. The Hoya reported that University officials, fearing student demonstrations, opted to conduct the program there because greater security could be provided. A small number of protesters did gather, most opposed to the naming of the Library for a casualty of the Vietnam War. Dr. Donald R. Penn, long-time professor of History at Georgetown, delivered the dedicatory address in which he described the opening of Lauinger as “a giant step forward” and “a milestone is the history of Georgetown.” Howard W. Gunlocke, a 1934 graduate who had funded the Library’s rare book room and special collections department, was awarded an honorary degree. Musical entertainment was provided by the University Glee Club and the Georgetown Chimes—Lieutenant Lauinger had sung with the latter group while a student. The cornerstone was laid in a low-key ceremony held six months after the Library’s dedication.